I am in love with the cover of this book. I want to give the designer a round of applause. I'd have this framed in my house. That was my entire reason for picking up this book. You remember the old adage, never judge a book by it's cover? I should have listened to that, because the story inside never really matched the cover. 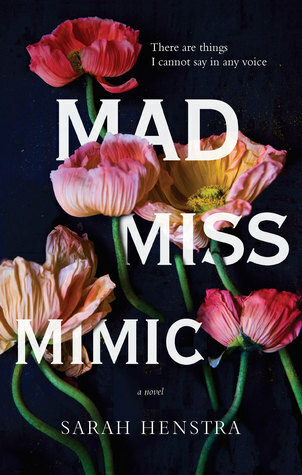 Instead of a girl traipsing through a meadow of beautiful flowers the reader is dropped in a Jane Austen era historical novel that reminded me of a light version of The Madman's Daughter by Megan Shepherd. Leo is from a wealthy family but she has a speech impediment that forces her to mimic those around her. She can do a perfect imitation of anyone's voice and can even repeat conversations she has overheard. This leads others to believe she is inhabited by spirits, doing this on purpose for attention, or worse yet trying to ruin the lives of others. I liked Leo as a character. She could be soft-spoken, or she'd allow other voices to do the talking for her, but at the end of the day she had a lot of internal monologue going on and the reader really understood the speech issue she was coping with and how it made her feel.I couldn't say the same for the people around her. Leo is surrounded by an arsenal of people not looking out for her best interests. Her sister being the worst. I was not a fan of the romantic subplot in Mad Miss Mimic. I didn't feel any real connection between Leo and her beau. Their relationship also verged in to eye-roll territory toward the end. It would have helped if there had been more showing of affection rather than telling. This book seemed to suffer from that trait a lot. Overall, this was an okay historical fiction novel. I liked the overall atmosphere and Leo herself but the other characters were not fully developed and the plotline felt shoe-horned in rather than built from the ground up. But, that cover is still gorgeous. Just saying.